1. Preheat the oven to 190°C, gas mark 5. Put all the vegetables, chorizo and the thyme into a roasting tin where they can all lie in a single layer. Season and add 2 tbsp extra virgin olive oil (more oil will come out of the chorizo once it starts cooking). Toss everything around with your hands and roast in the oven for 30 minutes, turning the vegetables over a couple of times during cooking. The vegetables should be almost tender. If the potatoes are still quite hard, put the dish back in the oven for a further 10 minutes. 2. Meanwhile, make the allioli. Crush the garlic to a paste with a little salt and mix in the egg yolks and mustard until shiny. Beating either with a wooden spoon or an electric whisk, start adding olive oil in tiny drops. Make sure that each drop has been incorporated before you add the next. If your mixture splits, just start again with a new egg yolk, and gradually add the curdled mixture to it. This can be made in advance and kept on the fridge for up to 2 days. 3. Season with the white pepper and add the lemon juice bit by bit, tasting until you’re happy. Cover and keep this in the fridge until you want to use it, but take it out of the fridge a little while before you serve it and stir it first. 4. 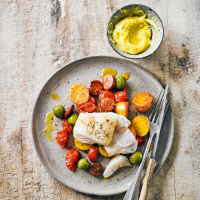 Mix the olives and the sherry with the vegetables, then put the cod on top. Brush the fish with the remaining oil and season. Put back in the oven and cook until the cod is cooked through and opaque (this should take around 20 minutes, but do check, as times will vary depending on the thickness of the fillet). Serve with wedges of lemon and the allioli on the side.